TVs can be really rather confusing, especially when manufacturers have different versions of the same tech and call them different things. But fear not, for T3.com is here to help you work out what's what. Netﬂix's big streaming rival, Prime Instant Video offers an abundance of movies and TV shows, all wrapped into the Amazon Prime service, which is available for a yearly subscription. It was the ﬁ rst consumer service to offer high dynamic range (HDR) content and ultra-high-deﬁnition (UHD) streams at no extra cost. Before digital, the signal used to broadcast programmes was analog. Analog signals are weaker than digital, and prone to 'snow' and dropout. The last analog signal in the UK was switched off in November 2013. You've probably guessed that we're not referring to scattering seed by hand – rather the transmission of video content to a wide audience via TV. The signal can be transmitted through aerial, cable, satellite and, increasingly, the internet. Closed captions are subtitles, useful for the hard of hearing or if you're watching something in a noisy environment. You can turn closed captioning on or off, as opposed to open captions, which are an integral part of a transmission. When it comes to television signals, digital is the slayer of analog. All TV signals in the UK are now digital, which means the signal is made up of a bunch of ones and zeros, instead of electrical impulses. This should mean less picture distortion and more reliable quality. An EPG is something that's found on most set-top boxes, and is an acronym for electronic programming guide. Most people will know it as the place where TV recordings build up to an unhealthy level, and taunt you for not having enough time to watch everything you record. Every TV has a frame rate – the higher the rate, the smoother the picture. Most movies work on a 24 frames per second (fps) frame rate, but in 2012 director Peter Jackson introduced the ﬁrst 48fps frame rate for his ﬁ lm The Hobbit: An Unexpected Journey. This codec has caused a lot of confusion. It's copy-protection software for 4K that was put in place after the ﬁrst wave of 4K TVs. It's favoured by Netﬂix and will be on Ultra HD 4K Blu-rays, too, so if your TV hasn't got it, you'll need to buy a new 4K TV to watch this content. This is the cable that makes the 4K magic happen. While you can get 4K through HDMI 1.4, this cable offers better bandwidth – which equals higher frame rates – and supports dual video streams. Essentially, it's future-proofed for a 4K world. Standing for high dynamic range, HDR is the next big shift in ﬁlmmaking. Both Netﬂix and Amazon support the feature, which enables more light to seep into footage, making for a vivid picture. This is all well and awesome but, as with all these things, you need an HDR compatible television to see it. A version of LCD that's brighter and more power-efﬁcient. LED stands for light-emitting diode and comes in two forms: Direct LED (back-lit and expensive) and Edge LED (edge-lit and more pocket-friendly). The HBO-chiding, cinema-taunting, ﬁ lm-producing, TV-making, 'Say no to downloads but yes to streaming' behemoth. Nefix has become the most in-demand on-demand service, thanks to its hugely popular shows, such as House Of Cards. Organic LED displays offer more picture control – each pixel can be separately lit – and better quality than your standard LED screen. They're pricey at present, though, and currently just LG and Panasonic are making TVs with this tech. Linear television is still a thing for many (think Strictly/The X Factor) but on-demand TV is increasing in popularity. It means you can watch shows and movies when you want to, as long as they aren't tethered to a scheduled programme guide. Regardless of the size of your TV screen, the picture is made up of tiny pixels, the basic unit of a digital image. With Full HD content, the pixel ratio is 1,920 pixels horizontally by 1,080 pixels vertically. 4K ups this to 4,096 x 2,160 pixels. Standing for personal video recorder, this is what you use to record TV shows and ﬁlms. Most people's PVRs will be in the form of a set-top box from the likes of Freeview, YouView, Sky, BT or Virgin, and they vary in hard-drive space. Sky has announced that its Sky Q box will have 2TB. 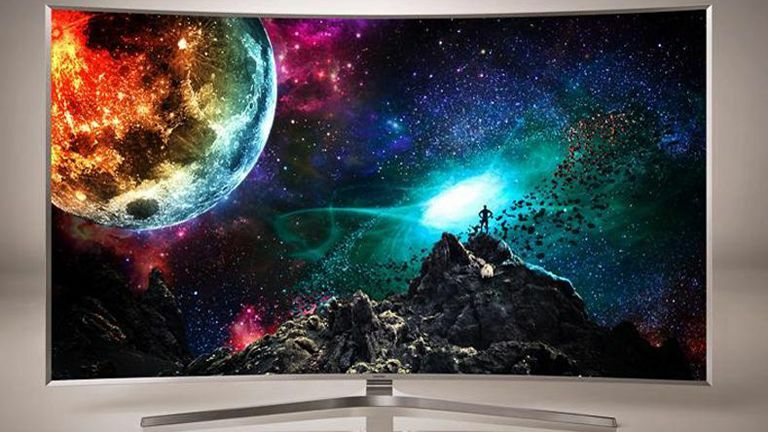 In a bid to match the quality of OLED but on a cheaper scale, Sony and other companies are using something called quantum-dot technology. This tech enhances the colour of back-lit pixels, thanks to the use of some nifty ﬁlters. Your TV's frame rate is one consideration (see previous page); another is its refresh rate. This used to be set at 60Hz, but some TVs now offer rates up to 240Hz. The higher the rate, the greater the reduction in screen blur, though there are question marks over whether huge refresh rates are actually beneﬁcial. You can get television content in a variety of ways: via an aerial, a cable, the internet or satellite. Sky is the biggest satellite-TV provider in the UK, offering hundreds of channels, some of which you have to pay for (sports, movies, etc). Although the service is reliable, weather can sometimes mess with the signal. Remember those quantum dots from earlier? Well, this is Samsung's version of that technology, which goes under the banner of S Ultra High Deﬁnition Television. Samsung is being coy as to what the S stands for. We reckon it's probably Susan. For most people, Ultra HD is just another name for 4K. But the ofﬁcial line is that Ultra HD has a slightly lower resolution – 3,840 x 2,160 to 4K's 4,096 x 2,160. This hasn't stopped the likes of Samsung adopting the nomenclature, though. It's not part of the TV landscape yet but virtual reality will deﬁnitely make movie waves in the next few years, thanks to the technology being adopted by a number of ﬁlm-makers. Virtual reality is an umbrella term for any environment that can be interacted with in a seemingly real way – even if it's just a turn of the head. Exciting stuff. Now why not check out our guide to the best TV?